Size: Glass size- 12.5 " X 12.5". 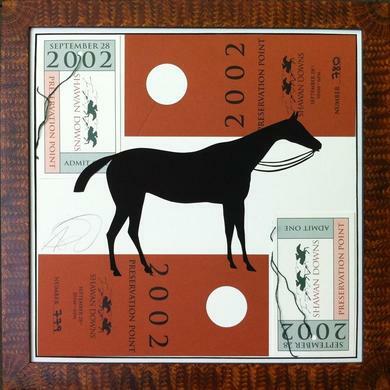 Framed size is 13.5 X 13.5"
Silhouette horse with Shawan Downs Reservation Point tickets from the first year of the event 2002. This Septrmber will be the 10 anniversary. Hand made frame shown here. There are other frame choices.